Hanging Sign Hardware - - Every hanging sign needs a secure, non rusting link of some kind to go between the sign and the screw eye, chain, or sign post loop. One option is a stainless steel S hook that loops into your sign and then onto your sign post rings or chain. 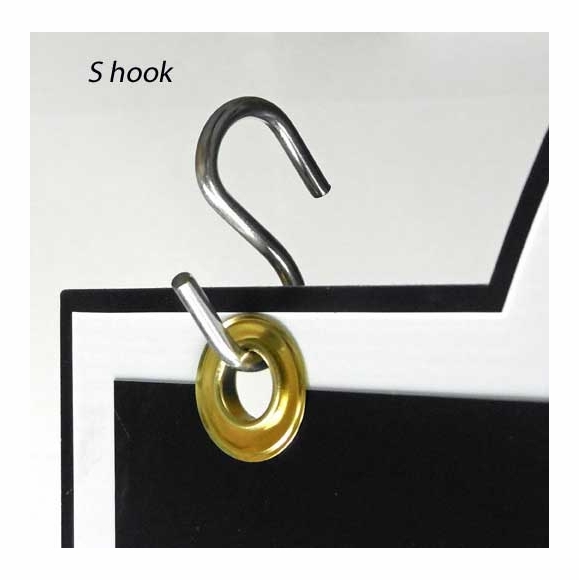 The hook can be used as supplied, or you can squeeze the ends of the hook together after installation to help ensure that your sign does not disengage. The "S" hook is stainless steel, approximately 2.0" long, has 1/8" diameter wire, and is 9/16" wide inside. See Related Products for another hanging sign hardware option and a large selection of hanging signs. Comfort House is your source for secure non-rusting hanging sign hardware.